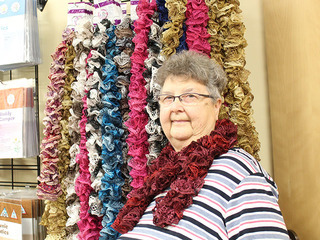 GSGWM employee Patty Canuel is helping support our Unleashing Her Potential campaign by selling homemade scarves (see photo). Perfect for holiday gifts, scarves can be purchased for $10 and 50% of the proceeds will go toward our campaign that helps provide vital leadership programming to the over 10,000 girls we serve throughout New Hampshire and Vermont. Scarves will also be available for purchase in our Bedford office lobby. There are many ways to help support this campaign – whether you make a donation or buy a scarf, every gift counts and makes a true difference in a girl’s life.